For a small state like my home of Rhode Island, the relationship with neighboring states is of considerable importance. 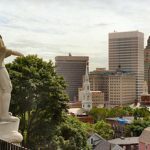 The state’s capital and most populous city, Providence, is an hour from its much larger neighbor, Boston, and a 20-minute drive from the Connecticut border. This proximity can be a strength, allowing for flexibility and movement across borders, but it can also tempt people and businesses out of the state. One potential factor influencing where people choose to live, work, and conduct business is how much they will be taxed in different places. But just how much of a factor are taxes, and how does their influence compare to the appeal of other considerations, like educational and employment opportunities and quality of life? A Look at Tax Burdens Across the U.S. While federal taxes are consistent across the country, state and local taxes on income, purchases, and property vary considerably. State income tax rates show the most variation: seven states do not impose any income tax, while residents in California’s top income bracket face a rate of 13.3%. (b) Most states, including Rhode Island, have progressive tax structures, in which tax rates are higher on those with greater incomes. Nine states, however, have a flat tax, in which everyone across the income spectrum pays the same rate. Depending on the specific rates, states with flat tax systems can be more attractive to high-income workers because they often pay a lower dollar amount than in progressive tax systems. The reverse is true for low-income workers, who typically benefit more from progressive tax systems. Rhode Island’s personal income tax is structured into three brackets: 3.75%, 4.75%, and 5.99%. The state previously had much higher rates for middle- and high-income earners, starting at 7% on people making more than $34,000 a year and maxing out at 9.9% for the highest earners. 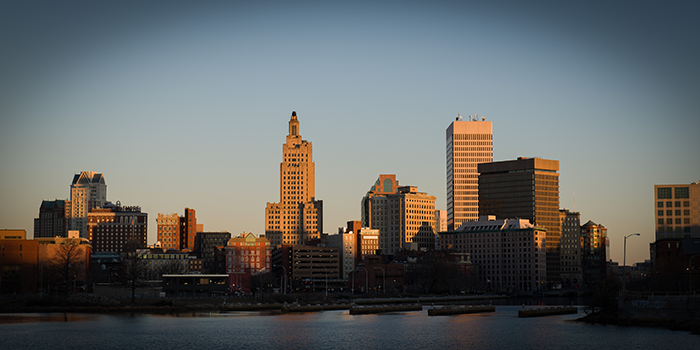 Rhode Island significantly lowered its rates beginning in the 2011 tax year to change its reputation as a high-tax state and to attract business and residents. 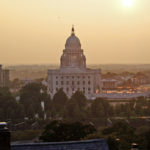 After this policy change, Rhode Island went from imposing a much higher tax burden than its neighbor states to, in most cases, offering slightly lower tax rates. Connecticut’s income tax schedule has six brackets, ranging from 3% to 6.7%. Its tax rates are generally the same as or higher than Rhode Island’s, except for people earning less than $10,000 a year. Massachusetts, on the other hand, imposes a flat tax rate of 5.25% on all residents regardless of income. (c) Compared to RI’s progressive tax structure, low- and middle-income earners pay higher taxes in Massachusetts, but the highest earners (those making over $129,900) pay less. 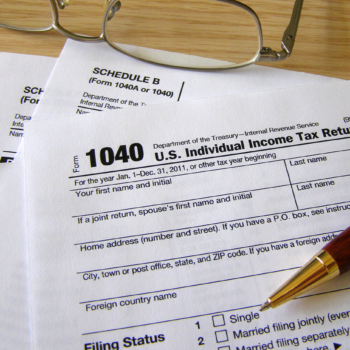 Do Taxes Affect Where People Choose To Live? It is clear from the wide range of income, sales, and property tax rates across the country that people can significantly alter their tax bills by moving across state borders. There is no clear academic consensus, however, on how much tax rates actually affect where people choose to live. 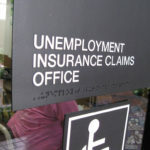 Research indicates that, in the U.S., migration tends to flow from states with higher state and local tax rates to states with lower tax rates, especially for people at higher income levels.5 These findings are complicated, however, by the fact that low-tax states may have lower costs of living, better employment opportunities, or lower housing prices, which are also attractive to individuals moving for economic reasons.4 U.S. Census data shows that most Americans move for reasons related to employment, housing, family, or quality of life. Are Taxes Driving Migration out of Rhode Island? While it is easy to imagine that taxes influence where people choose to live, a number of other factors play a role, and the exact impact of specific tax policy changes is difficult to ascertain. The question of how tax rates affect a state’s ability to attract and retain residents is still open for debate. What is clear is that states in some sense “compete” for residents – particularly wealthy and highly skilled ones – and should consider all the factors that may play a role in determining how they stack up against their neighbors and the rest of the country. Raven Molloy, Christopher L. Smith, and Abigail Wozniak (2011) “Internal Migration in the United States,” Journal of Economic Perspectives, 25(3): 173-196. Jacob Feldman (2012) “State Income Migration and Border Tax Burdens,” Washington, D.C.: Americans for Tax Reform Foundation. Charles Tiebout (1956) “A Pure Theory of Local Expenditures,” The Journal of Political Economy, 64(5): 416-424. Jeffrey Thompson (2011) “The Impact of Taxes on Migration in New England,” Political Economy Research Institute, University of Massachusetts, Amherst. Mark Gius (2011) “The effect of income taxes on interstate migration: An analysis by age and race,” The Annals of Regional Science, 46(1): 205-218. Antony Davis and John Pulito (2011) Tax Rates and Migration, Mercatus Center, George Mason University. Andrew Lai, Roger Cohen, and Charles Steindel (2011) “The Effects of Marginal Tax Rates on Interstate Migration in the U.S.,” New Jersey Department of the Treasury, Office of the Chief Economist/Office of Revenue and Economic Analysis. Cristobal Young and Charles Varner (2011) “Millionaire Migration and State Taxation of Top Incomes: Evidence from a Natural Experiment,” National Tax Journal, 64(2): 255-284. J. Scott Moody and William J. Felkner (2011) “Leaving Rhode Island”: Policy Lessons from Rhode Island’s Exodus of People and Money, Providence, R.I.: Ocean State Policy Research Institute. Richard Borean (2013) “Monday Map: Migration of Personal Income,” Tax Policy Blog, The Tax Foundation, August 19. Editor (2011) “Ocean State Policy Research Institute says Rhode Islands estate tax is the most significant reason people leave the state,” PolitiFact Rhode Island, Feb. 13. Jonathan C. Rork and Karen Smith Conway (2011) “State ‘Death’ Taxes and Elderly Migration – The Chicken or the Egg?” Federal Reserve Bank of St. Louis. (a) Measured in absolute terms, property taxes range from $539 per capita in Alabama to $3,106 per capita District of Columbia, with a national median of $1,296. Rhode Island’s property taxes are $2,083 per capita, the seventh highest in the country. (b) In addition, 16 states permit localities to impose local income taxes, ranging from 0.0067% in Lane County, Oregon to 3.6% in Reading, Pennsylvania. (c) Massachusetts’s flat income tax structure is not without its critics. A bipartisan Tax Fairness Commission appointed by the state legislature recently recommended replacing it with a progressive tax structure. (d) Democrats in the New Jersey State Legislature are currently pushing to raise the top tax rate by another 2 percentage points. Dr. Carter is a Professor of Management and has been at Rhode Island College since the fall 2001. Dr. Carter teaches Human Resources, Compensation, Labor Relations, Foundations of Management, Organizational Theory, and Business, Government, and Society.